This traditional Ayurvedic oil uses the unrefined oils of Sesame and Coconut that have been naturally processed, making them nutrient rich. 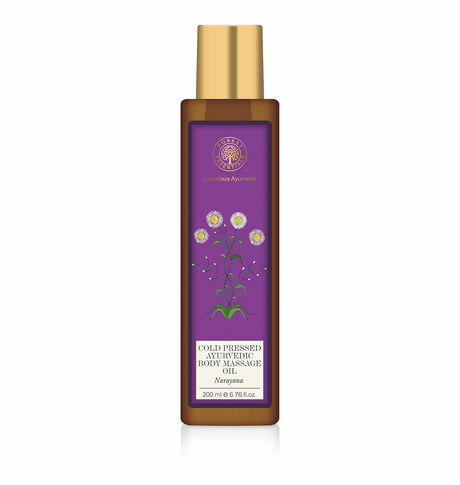 This massage oil is ideal for relieving muscle and joint pain as it penetrates deeply to bring instant relief, as well as re-energizing the body. This Narayana Ayurvedic Body Massage Oil is anti-inflammatory Ayurvedic oil which not only helps in relieving pain but also strengthens the bone tissues, and tones and firms the muscles. It is a powerful antioxidant as well and penetrates the body tissue faster than any other ointment. It helps to bring instant relief from backaches, muscular strains, rheumatic pains and joint pains. Herbs like Pithwan and Deodaru are very well known for their effectiveness in backaches, muscular sprains and joint pains. Essential oils of Camphor, Eucalyptus and Ginger are invigorating and balancing, and relieve muscle as well as joint pain.